Winemaking is inherently water-intensive. From growing grapes in the vineyard to washing barrels in the cellar, it is not uncommon for wineries to require hundreds of gallons of clean water to produce 1 gal of wine. According to the Wine Institute, an industry advocacy group, wine is California’s most valuable finished agricultural product, boasting an economic impact that generates $57.6 billion in activity for the state. Maintaining this vitality means pivoting to operate in a water-strapped environment. While California has experienced record wet conditions in 2017, the past five years of severe drought exposed major water use challenges across the state. Fortunately, California has a rich history of implementing innovative solutions to help protect freshwater sources—winemakers included. In the winemaking industry, reuse efforts traditionally have focused on the crop-growing side of the business, where the majority of the freshwater is consumed. Paling in comparison, post-harvest water consumption in a winery typically ranges from 2.5 to 6 gal for every gallon of wine produced, but as water levels decline and costs for clean water rise, every drop and dollar count. The University of California, Davis (UC Davis) is at the forefront of the wine industry’s water conservation and reuse efforts. 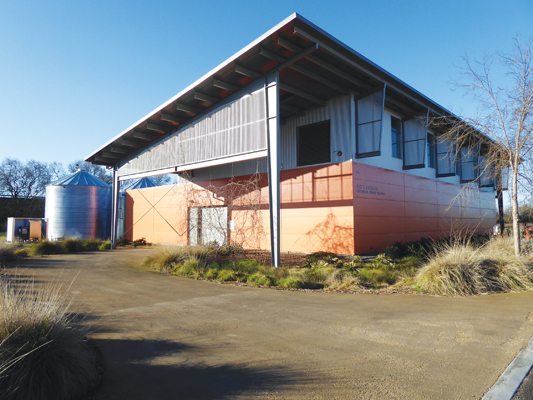 Its 8,500-sq-ft Jess S. Jackson Sustainable Winery Building features high-thermal insulation, solar panels and rainwater capture to reduce energy usage and conserve freshwater. The winery is the first of its kind in the world to earn LEED Platinum certification from the U.S. Green Building Council. In early 2016, UC Davis embarked on a project aimed at dramatically reducing the amount of freshwater used in the post-harvest cleaning process. It teamed with GE Water & Process Technologies and Winesecrets, a local California company and GE channel partner focused on delivering separation technologies that improve efficiency, eco-performance and wine quality. The initial goal of the project was to collect and treat rainwater from the Jess S. Jackson Sustainable Winery Building and other campus buildings, and use it to clean tanks and equipment inside the winery. The pilot at UC Davis processes 7,000 gal of water per day, but can be scaled up should an application call for it. Rainwater capture was a natural choice because the benefits of rainwater are plentiful. The low levels of contaminants such as sodium, chloride and phosphate reduce overall treatment costs and make for a more environmentally friendly process. The ability to operate from storage rather than on demand. The rainwater capture system transports the rainwater from roofs, through the downspouts and into a holding tank with a capacity of 1,200 gal. After going through a 50-μ filter, the water is pumped into two 45,000-gal storage tanks that feed a reverse osmosis (RO) system. An E4 Series RO unit, donated by GE Water & Process Technologies, removes trace organic contaminants such as debris, dust and pollen, along with microbiological contaminants such as bacteria, viruses and mold that can settle on the roofs. The system includes a 1-μ prefilter, permeate and concentrate flowmeters, and pressure gauges that measure prefilter, post-filter, primary and final pressures. Winesecrets fabricated the mobile skid for the RO unit and assisted with the piping and connections that join the storage tanks to the RO system. Completing the treatment system is a Sievers 5310 online total organic carbon (TOC) analyzer that measures organic compound levels in the RO-treated water. The TOC analyzer ensures consistent quality and triggers an alarm in the winery’s data monitoring system when unacceptable levels of contaminants are detected. The processed rainwater then is pumped to and stored in four 45,000-gal tanks. The high-purity water is used for year-round cleaning of the winery’s fermentation tanks and barrels, while a smaller amount of low-purity water also generated in the capture and filtration process is used for onsite greywater applications, such as toilets. To further enhance the system’s sustainable impact, it is powered by the building’s solar panels and runs primarily during daylight hours while the panels are producing energy. The RO system processes 4.5 to 5 gal per minute and provides about a 75% recovery of clean water permeate after filtration. UC Davis, GE Water & Process Technologies and Winesecrets are working to increase that number to 80%, at which point every 100 gal of captured water will be equivalent to 80 gal of single-use freshwater. Out of the 4.5 to 5 gal of water processed per minute, approximately 3.4 to 4 gal are used for cleaning the storage tanks, while the rest is used to supply greywater. Since its inception, the pilot has enabled the winery at UC Davis to have more control over its source water by avoiding reliance on water from the Sacramento River, which experiences varying quality and availability. Overall treatment costs have been reduced, making treated rainwater a more environmentally friendly, sustainable and cost-effective option. Combining RO and TOC technologies in this way can greatly enhance the winemaking industry’s sustainability efforts, creating a cost-effective and sustainable approach to water treatment—whether in times of drought or abundant rainfall. Ryan Hertel is sales manager for GE Water & Process Technologies. Hertel can be reached at [email protected] or 612.900.6808.